Well, it finally happened. We became those parents at the store that make bystanders bawk in hushed tones and not-so-discreetly stare like we're all furry blue monsters or something. AJ loves to run around. Nothing brings her more joy than walking and exploring on her own two feet. She is a toddler, after all. 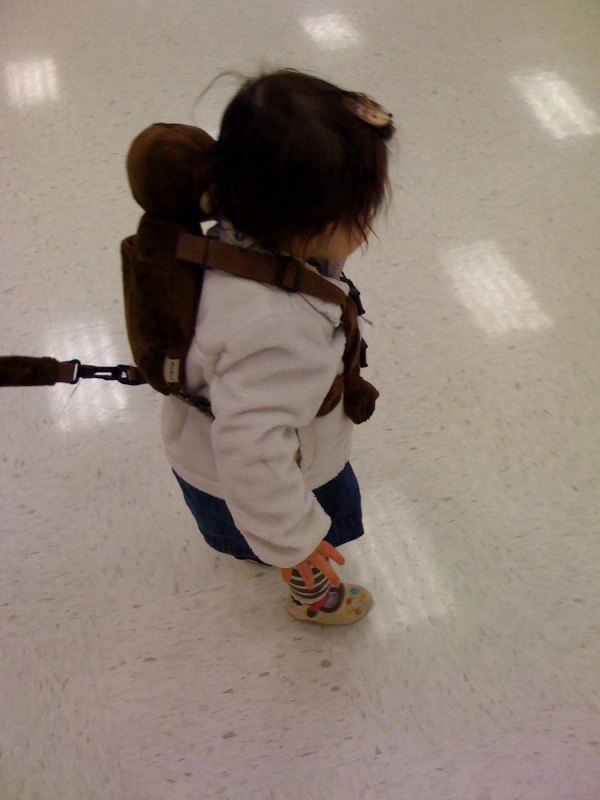 Well we have this cute little monkey backpack/harness from Eddie Bauer that we thought we'd try out. We had never used it before, and since we were going to Target anyways, we thought we'd try it out for a test run. AJ's first reaction: total excitement. She was giggling with joy that she not only got to carry her own backpack, but that she got to walk around Target instead of riding in the famed red shopping carts. The first three minutes were okay. Then she started to test her limits. She was trying to pull us in the direction that she wanted to go. We're talking full grunting, child leaning 45 degrees forward to try and get her way. Sigh. We were kind of in a hurry, so in an attempt to get us across the store to the hand soap that we were trying to purchase, my husband picked AJ up. You would have thought that we were trying to kidnap this toddler. She was kicking and screaming to get away from us. Embarrassed, we took her to a back corner of the store (the toilet paper section) to calm her down. Breeeeathe. In. Out. We got to a stable point again, so in the back of the store we put her back on her feet for a second try. I'll admit, she was doing a pretty good job this time. Until of course we got around other people again. We were near the freezer section where there was a display of seasonal coffees (the Christmas stuff) on clearance. As I was looking, AJ was walking her 3 foot radius around me in delight. Then she walked directly into the freezer and bounced off it with her forehead. Oh no. She flattened out on the floor like a pancake and began to scream. A woman checking the dates on the gallons of milk cast me a dirty look like I whipped the leash and threw my child on the floor. A couple kisses and hugs and AJ was back to her usual spunky self (the perfect remedy for a toddler). However, our embarrassment was through the roof. Luckily, our darling daughter obliged and let us put her in the cart for the rest of the Target trip. Thank goodness. Moral of the story: If you're going to use a child harness (which I don't have anything against), try it out in private first, far away from judging eyes. LOL Oh man! Well, they will flip out at some point in public with or without a harness and it is always so embarrassing! I always feel bad for the moms I see this happen to. I always love when they choose a restaurant or some other super quiet place to do this! On the kidnapping comment, you know, I wonder how many of us would really pay attention to a toddler who appeared to be throwing a tantrum with someone who appeared to be the parent kwim? scary thought. I hate those stares. I get them. A. LOT. Thanks to my "non-conforming" 3 year old. Let the world get over it - he is THREE! !